Please note that I am rarely here. 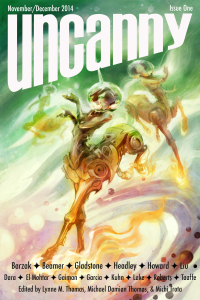 I’m the co-publisher and co-editor-in-chief of the 2016 Hugo and Parsec Award-winning and World Fantasy Award finalist Uncanny Magazine. I was the managing editor of the Hugo Award Finalist Apex Magazine and co-editor of the anthologies Glitter & Mayhem and Hugo Award finalist Queers Dig Time Lords. I was a contributor to the SF Squeecast podcast and am currently a contributor to the Down and Safe- Blake’s 7 podcast. Well, this year has flown by, except for the parts that were excruciating like living at the hospital. Yesterday Caitlin had her 3-month check-up appointment with the orthopaedic surgeon. He is extremely pleased with Caitlin’s progress. Essentially, Caitlin is back to where she was before the surgery, but now she can sit again. Everything looks great to him, so just one more month using her brace for transfers. Quick plug. Mad Norwegian Press is having an eBook sale on the Hugo-nominated Queers Dig Time Lords. It’s currently just $4.95 at Amazon and Barnes & Noble. Lynne and I are slowly working on some things. We’re hoping to ramp up next week once Lynne finishes some projects at the day job. I have new professional photos! They should be up in a week or so. I was nominated for two Hugo Awards! Finally, Rachel Swirsky’s Apex Magazine story “If You Were a Dinosaur, My Love” was nominated for the Best Short Story Hugo Award and Nebula Award! This is the first time a story that I co-edited has been nominated for a major award. I am SO HAPPY for Rachel! I’m absolutely honored and overwhelmed. We are extremely proud of QDTL & our run at Apex Magazine. We worked with phenomenal people. We couldn’t have done it without such amazing contributors and co-editors. Lynne and I were finally at a live Hugo Awards announcement at Minicon. It was fun hearing it with our friends. We were also able to celebrate with a nice dinner that became wonderfully raucous. Now that things are getting back to normal for Lynne & me, we’re starting to plan for the future. We did our first SF Squeecast together, and it was a blast. We love our partnership. We really make the other one better, and last year was extremely successful for us as editors. It’s wonderful to see so many stories, essays, and poems we worked on together (and with others) get award recognition, Locus recommendations, and reprinted in year’s best anthologies. We are sadly missing Wiscon this year. As you can see, Lynne and I are guests at Phoenix Comicon the next weekend. Now that we have to take Caitlin with us to conventions, we decided that two weekends in a row would be too much for her to tolerate. It would also be extremely hard on Lynne and me. We might be at C2E2, but that hasn’t been decided yet.